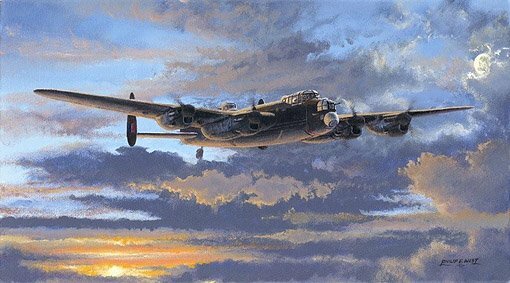 The Avro Lancaster was undoubtedly the RAF’s greatest bomber of World War 2. Stemming from the unsuccessful Avro Manchester the Lancaster carried the night bomber offensive deep into occupied Europe. Over 7,300 Lancaster’s were built with the last being delivered in 1946. The Primary Edition is signed and numbered by the artist. The Artist Proofs are signed by three Lancaster pilots. For their details please see below. Flt. Lt. Joe Petrie-Andrews DFC. DFM joined the RAF at “about 14 or 15 years of age.” Rejecting the opportunity to become a bomb-aimer, Joe was determined to pester the RAF until they would accept him on a pilot’s training course. Flying mainly Lancaster and Halifax aircraft, Joe joined 158 and 35 Squadron’s, and later became part of the Pathfinder Force. During an operation to bomb Cannes in southern France on 11th November 1943, Joe’s (aged only 19) Halifax was badly shot up, forcing him to ditch the aircraft in the Mediterranean, where he and the crew spent three days in a dingy before being rescued; for this operation Joe was awarded an ‘immediate’ DFC. He completed 68 operations, 60 before his 20th birthday on 11/7/1944. Sqn. Ldr. Lawrence “Benny” Goodman (Pilot) – 617 sqn Lancaster pilot who completed 30 missions. Notable raids he took part in were on the Tirpitz (29/10/44), dropping the Grand Slam 22,000 bomb on the Arnsberg Viaduct (19/03/45) and the attack on Berchtesgarten ‘Eagles nest’ (25/05/45). Flt Lt Russell (Rusty) Waughman DFC, AFC, (Pilot) volunteered for the RAF in 1941. After training in Canada, he qualified as a heavy bomber pilot. In November 1943 he was posted to No 101(Special Duties) Squadron at Ludford Magna. He completed a tour of operations, which began during the ‘Battle of Berlin’, where they did several operations. Surviving a mid-air collision, only to write the aircraft off on landing, ‘Rusty’ and his crew on a subsequent flight had a miraculous escape when their aircraft was blown upside down, over the target, at Mailly-le-Camp; they also survived the Nuremberg raid on 30th March 1944, when 97 aircraft were lost – including about one quarter of 101 sqn strength that night.